Amazingly I could find nothing, which I don’t understand. 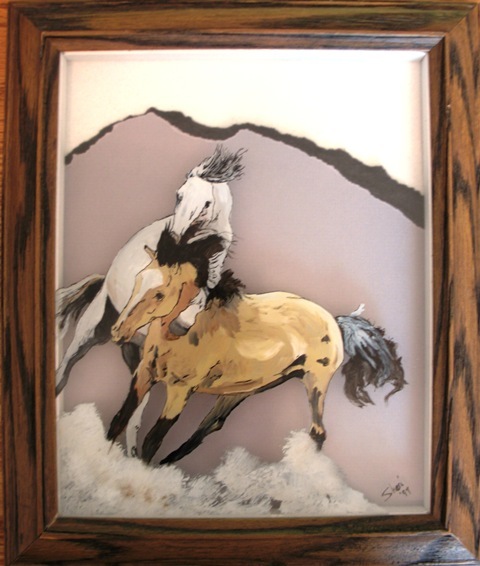 Years ago, before the internet existed, I learned how to create reverse glass paintings and was selling them around the state. The very first step, when making the fine lines, was to use a Koh-I-Nor Rapidograph Technical Pen, which adhere’s nicely to glass, as well as takes to oil paint being laid over the top of it without smearing or breaking down. This was a lot of fun, easy to do (as long as you remember to paint everything “backwards” and mirror image”.) So, when I was contemplating laying ink on glass this morning, it seemed like there should be even better technology for this now than there were years ago. The internet came up empty. The rapidograph pen is pretty thin lined. Maybe I could use a brush to accomplish the same idea for a wider line. If anyone has any ideas, please let me know. In fact, has anyone out there tried this? I can’t even remember where I learned how to do it, but I love the combination of the “sketch” look with the richness of the oil paints. This entry was posted in Flashback Art and tagged black ink on glass, drawing pen, Koh-i-nor pen, oil painting, painting on glass, rapidograph, reverse glass painting. Bookmark the permalink.